Ideal as a gift for someone special, or for you to try out the experience of flying an aeroplane yourself before commencing a course of training. It is where most pilots started! We offer a range of lessons from 30 minutes in a two seat aircraft, to a land away trip to the Isle of Wight in a four seat aircraft whereby you can take along a friend or two in the back. Under the guidance of one of our instructors you will be shown how to carry out basic manoeuvres and then given the opportunity to fly the aircraft yourself! Don’t forget to bring your camera to record your experience. If you live locally then it is usually possible to over fly your home and see it from a new viewpoint as you soar above the beautiful Sussex countryside. Contact us to purchase a voucher (valid for 6 months) for one of the adventures listed below. If it is for a gift then we will send it to you in a plain envelope to maintain the surprise. You can make it part of a day out to the historic aerodrome of Shoreham and local cosmopolitan town of Brighton. A complete birthday gift! All lessons are flown in fully dual controlled aircraft that enables the instructor to demonstrate how to manoeuvre the aircraft before handing over control, for you to fly yourself. 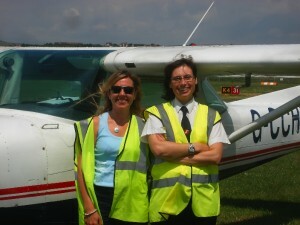 If you would like to make the flight more unique, take advantage of our Isle of Wight Adventure. As well as learning to fly you can then not only enjoy the beautiful views of the South Downs and South Coast of England, but the Isle Wight too before landing at Sandown Airfield. Here you can enjoy a beverage, and cake perhaps, before starting your return journey! For those with the adventurous spirit the ultimate thrill could be “Going for a Spin”! In our fully aerobatic Cessna 152 your experienced instructor will first talk you through the various stages of the spin entry and recovery, and then demonstrate the manoeuvre. If you wish you can then have a go yourself under strict supervision of course! If you wish to go further a field, perhaps to France, for the day or have a larger group we are also able to accommodate this on one of our charter aircraft. An excellent way to find out if flying is for you. Two 40min flights with briefings and a refreshment break.